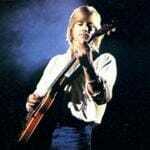 Learn how to play Justin Hayward – Forever Autumn note-for-note on guitar. This lesson teaches Justin’s guitar part from a live solo version (just him and an acoustic guitar) recorded for Radio Q104.3 in New York. The complete file contains a lesson video, a performance play thru video, full tabs, chords and lyrics. You’ll receive a link to download the lesson which will download as a zip file of 242 Mb containing all the lesson content. It’s number 418 on the to-do list.